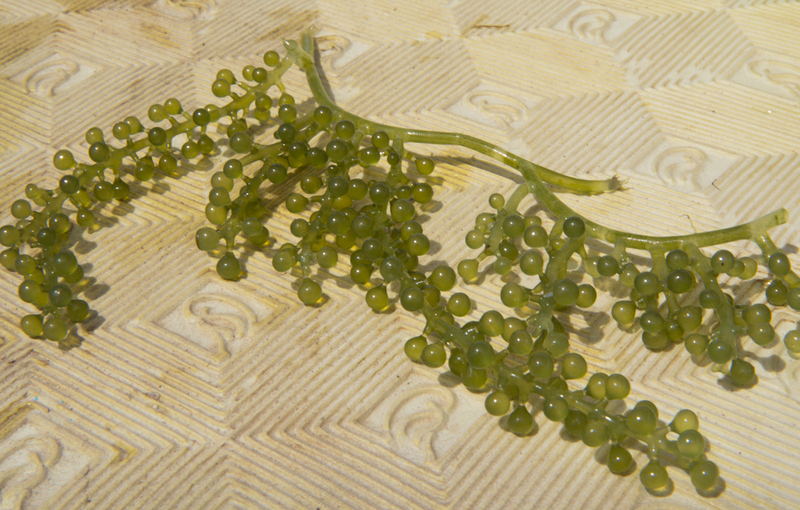 This weird seaweed that looks like small grapes is called lato or caulerpa lentillifera. It’s very popular in the Philippines and in Japan, where people call it umi-budo. I went to Coron, in the Philippines, to meet the Tagbanua tribe that makes a living harvesting and selling it. Follow me. 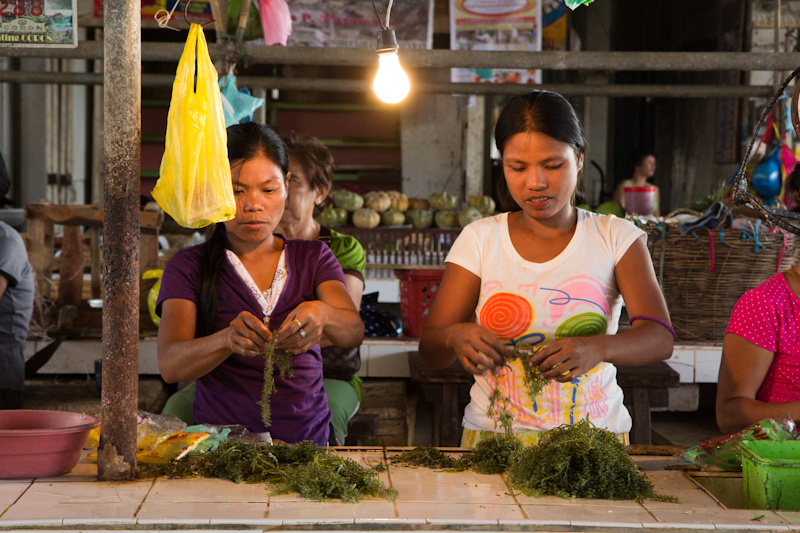 If you walk around the stalls of the markets in Palawan, you’ll certainly see this strange and enigmatic seaweed. Lato looks funny. It’s not obvious at first sight, but it’s edible and delicious. But how can you prepare and cook it? 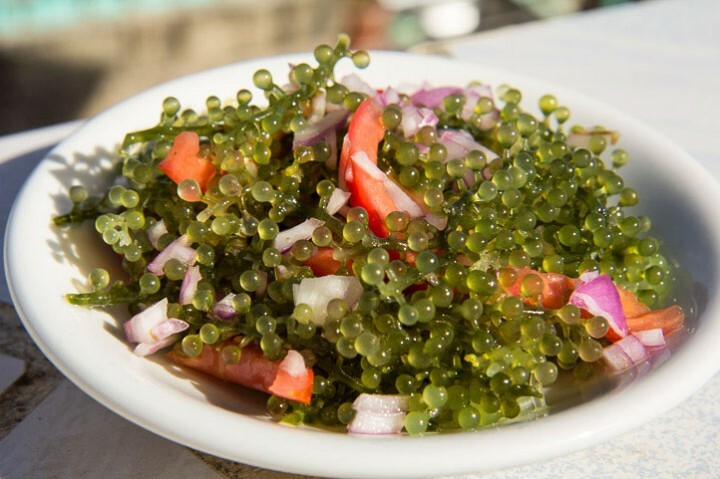 Let’s start at the beginning, we’ll follow the lato from the sea to your plate. Our weird seaweed doesn’t grow on the seashore but in intertidal zones, close to mangroves. That kind of site is common in Palawan, and the water temperature is perfect for the lato as it rarely goes down under 29 degrees Celcius. Well, 29 degrees in surface, because lato grows at the bottom of the sea, between 3 and 5 meters deep. 3 meters for low tide, 5 meters for high tide. So, since it grows down deep, how is this seaweed harvested? Well, you have to dive to get it. I went to try this with the Tagbanua, the first settlers in Palawan – and probably the Philippines, according to anthropologists. 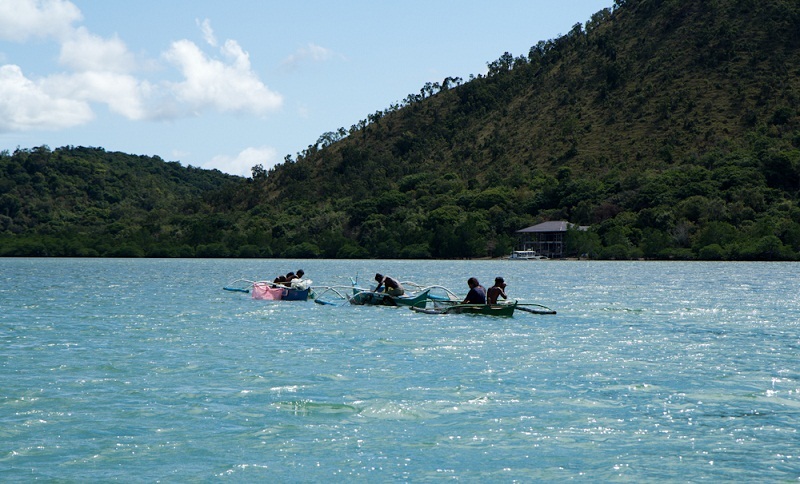 These men and women take their bangkas, the Filipino traditional boats, or outrigger canoes if you prefer, and get to the site. No engine on those bangkas, they have to paddle. The lato field, honestly, you’ll never guess it’s here. The only thing you can see from the surface is the sea, with mangroves on each side. The women stay on the boats, and the men dive, holding their breath. 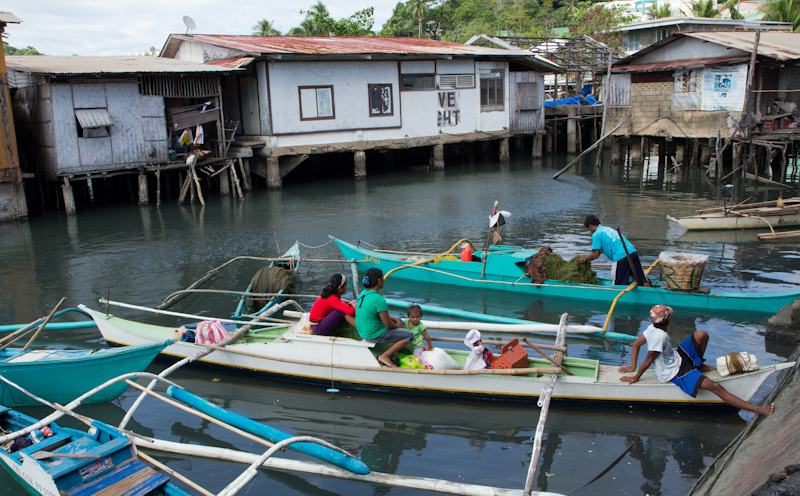 They harvest armfuls of lato that they put in nets tied to the sides of the boats. I watch them for a while, they I decide to follow them underwater to make a great picture of the marine field. But there’s a catch. Lato is slimy, really slimy. So slimy that the sea water is full of seaweed particules and slimyness. I’m swimming in a thick, green water, full of decomposing lato. It’s absolutely disgusting. Even though I have a great underwater camera, there’s no way to take a single photograph. First because the sunlight doesn’t get through the thick water. Second because I cannot see anything except green, green and more green. Green on green, the lato is perfectly invisible. When I go out of the water, I’m covered in a slimy gel from head to toes. We weigh the anchor, which is, of course, full of seaweed, so we decide to prepare a salad on the boat. After that, we follow the Tagbanua who are hauling the seaweed to Coron Town. With their bare hands, patiently, delicately, the men put the seaweed in baskets. Each one of them contains 60 kg of lato. Then they cover them with banana leaves, to keep it moist and to protect it from the sunlight. Indeed, the lato gets dry extremely fast. I’ve made the experience with a small piece of lato forgotten on the boat deck. In 5 minutes, it litteraly disappeared, there was only a tiny, minuscule bit left. Unlike Japanese seaweeds like kombu, there is no way you can dry the lato. According to the locals, it also shoudn’t be soaked in fresh water. It would melt. The big baskets will travel to Manila by cargo. There, their commercial value will increase dramaticaly. 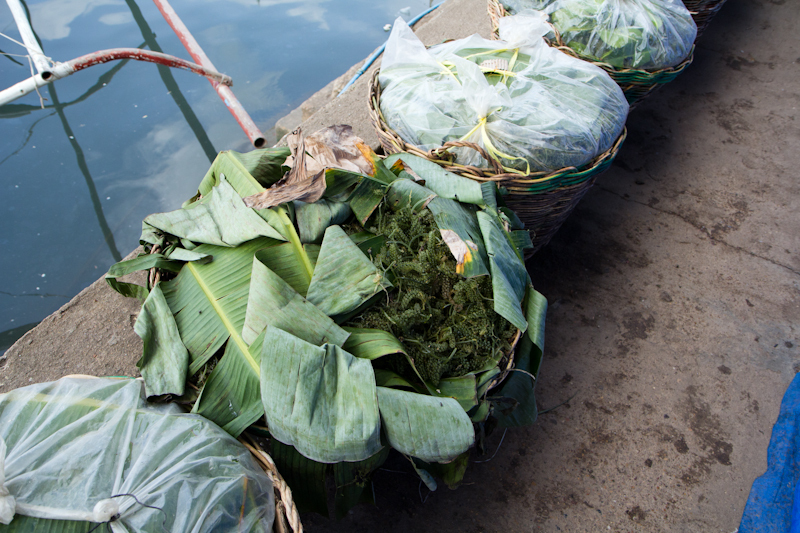 In Coron, the buyers get the lato from the Tagbanua for 8 pesos a kilo. In Puerto Princesa, the capital of the province of Palawan, the prices are already as high as 100 pesos a kilo. In Manila, it’s even more. Some of the lato will be sold here, at the Coron Town market. Men harvest it, and women clean it with the tips of their fingers. They remove the black and over-slimy parts. It requires a lot of patience, and it’s quite dirty. But as the lato doesn’t like fresh water, there is no way to rince it. They will then prepare small bags of 1 kg of lato that will be sold 10 pesos, so about 15 euro cents. I buy one of them, which makes them laugh, showing their red teeth – they chew betel. One small red onion, two mini tomatoes, some cane vinegar and pinch of salt, I’m ready to prepare a nice traditional salad. It’s very simple. You just need to cut the lato bunches and to put them on a plate. Then you add the onion and tomatoes, finely chopped. 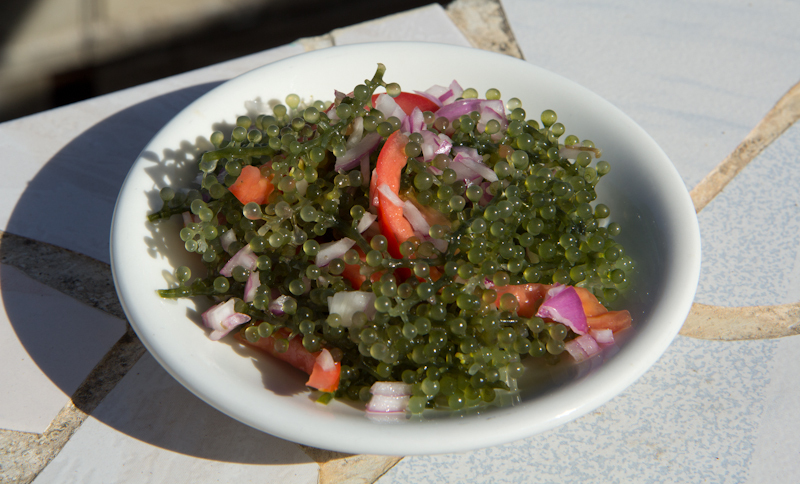 Add some vinegar and salt, and it’s done, you have the perfect ensaladang lato. You will feel the bulbs pop in your mouth as you eat it, which makes it really fun to eat. It’s also refreshing and healthy. Don’t wait for too long after pouring the seasoning on it, as it will become mushy very quickly. So, if you’ll excuse me, I have to go, my salad is waiting for me.